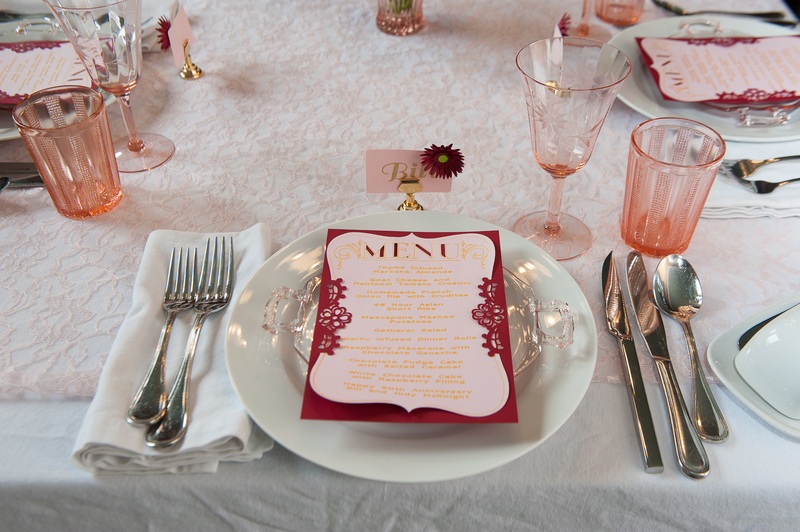 Fifty years ago this couple picked light pink as their wedding color. 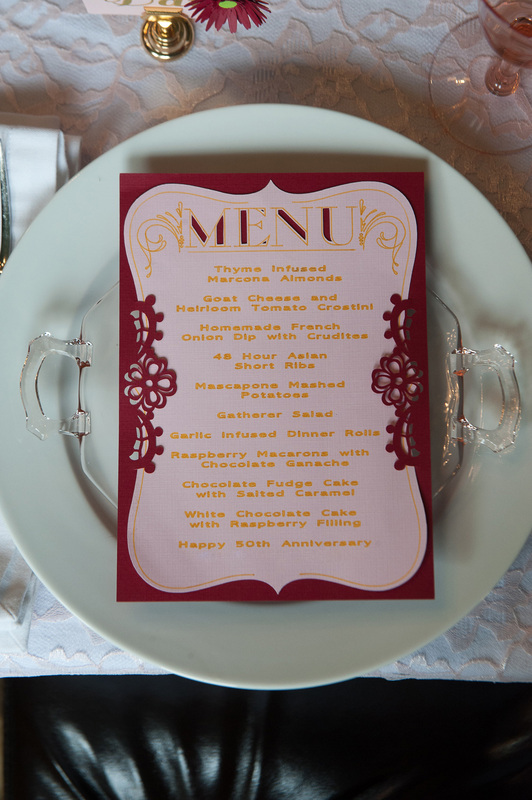 After 50 years, their tastes have changed, and they gravitate toward bolder colors such as maroon. 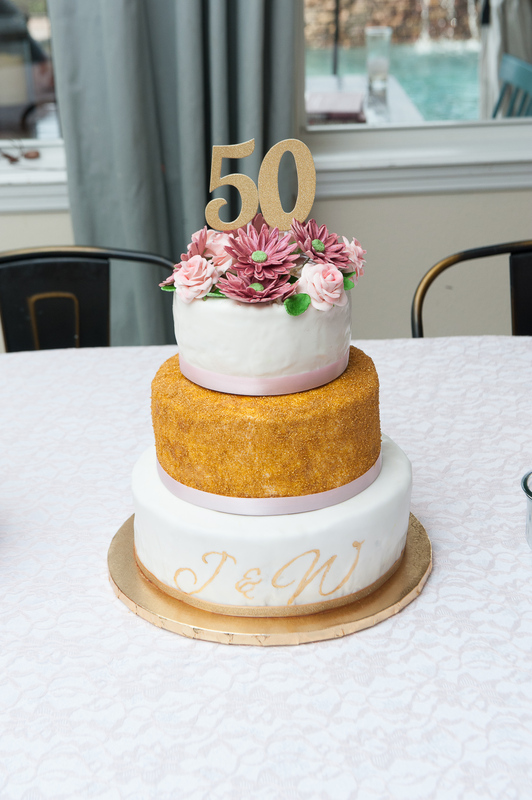 We thought it would be fun to combine the old color theme with the new in this party, along with hints of gold to commemorate their golden anniversary. A wedding photo of the couple was placed it in a shadow box and you can see in the background. 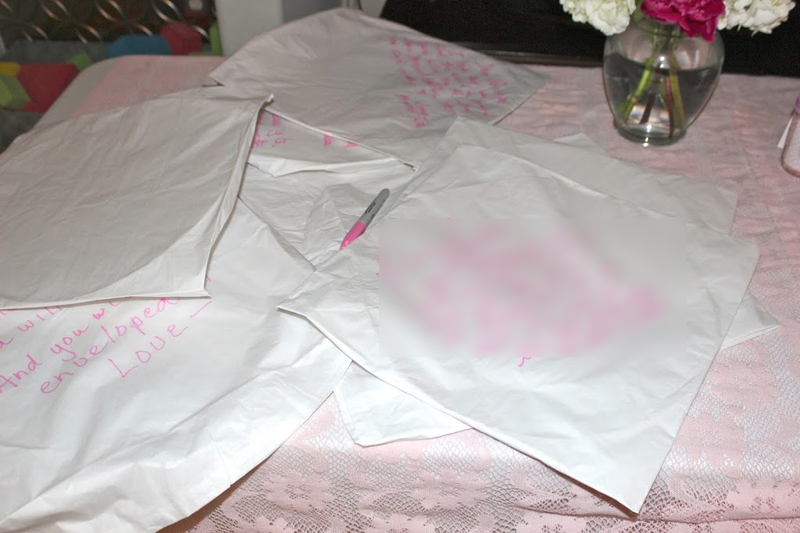 Gold sparkly paper was used to cut out the 50th letters in the shadow box and hurricane globes. As the evening progressed we lit the candles and created a romantic atmosphere. All the gold, glassware, and candles shimmered! 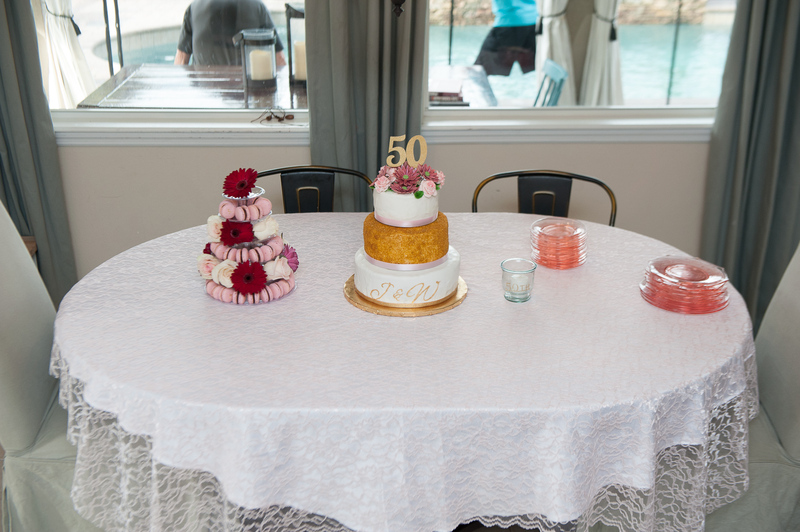 We placed a white table cloth on the table with a lace topper overlay. 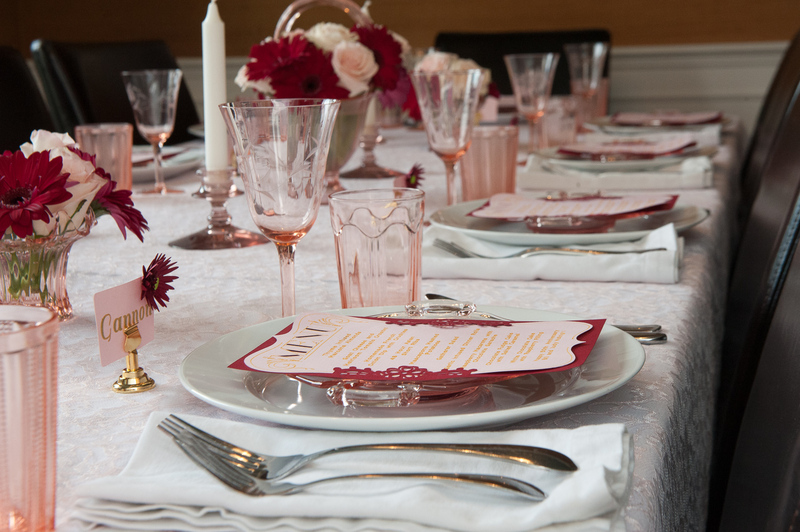 This combination creates a very elegant look when paired with the pink depression glass, white plates, and crisp white napkins. The lace topper is literally just fabric by the yard that I found at a fabric store and cut to the dimension I needed. 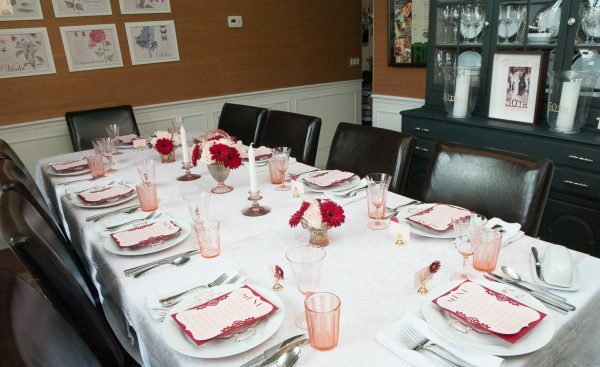 Similar fabric can be found in the shop this party list if you want to create the same look. I’m fortunate that I inherited the rose depression glass from family members; however, you can find similar depression glass at many antique markets or online markets. It is commonly found in shades of pink, green, yellow, and blue. 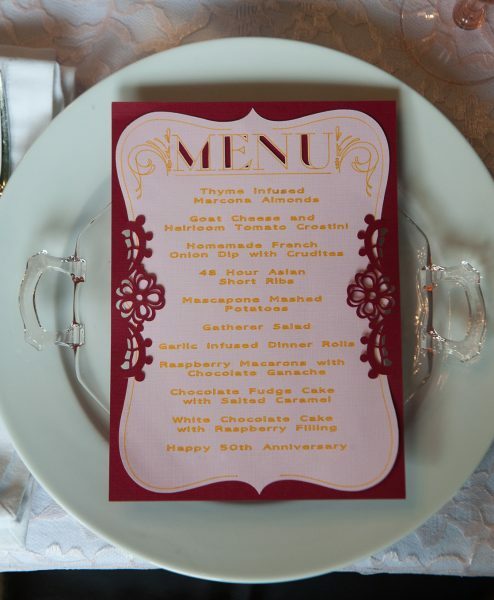 Menu cards were made on my Cricut Explore Air 2. The writing feature on my Cricut allows me to have the menu neatly printed out! We found a gold pen to write my menu. 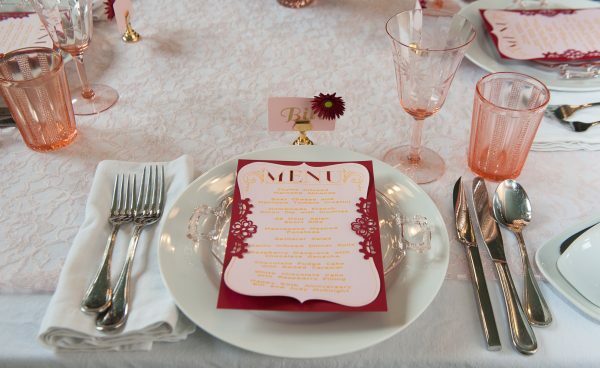 We use Cricut Design Space to create a lot of menus, place cards, and party decorations. The template for the menu above was included with my monthly subscription for Cricut Design Space. 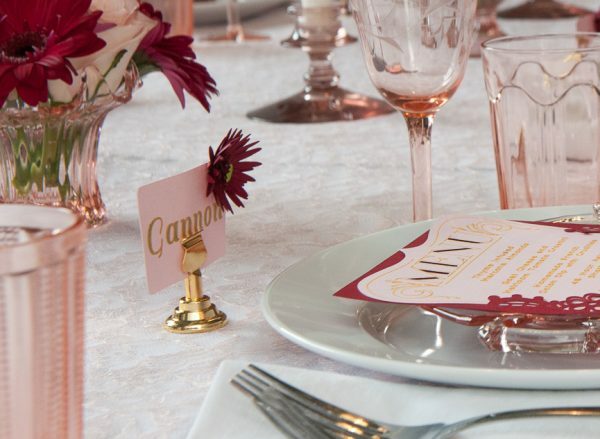 We made place cards for each guest using my Cricut Explore Air 2. In the Cricut Design Space we found a rectangle shape that had curved edges and then placed the name on top of that. We used the same gold pen to apply the beautiful font on top of the rectangle. We also found a Gerber Daisy template in the Design Space. Layers of the daisy are cut out and then glued together. 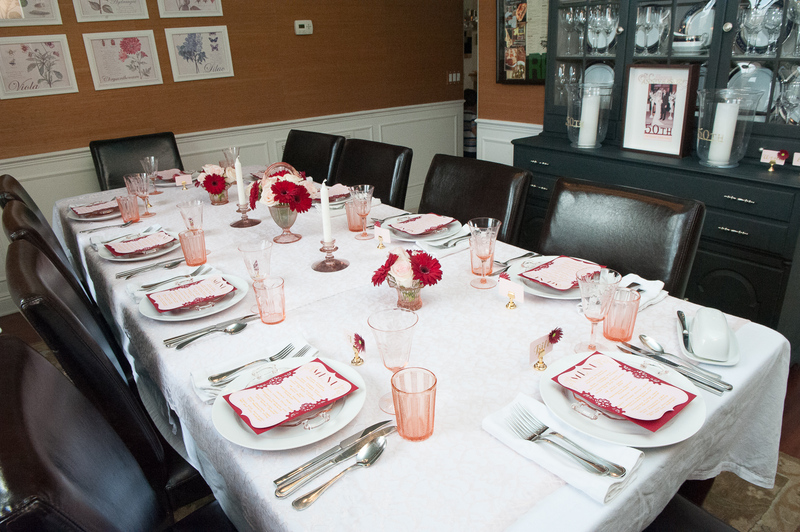 This couple had pale pink roses at their wedding so we wanted to include them in the dinner decorations. 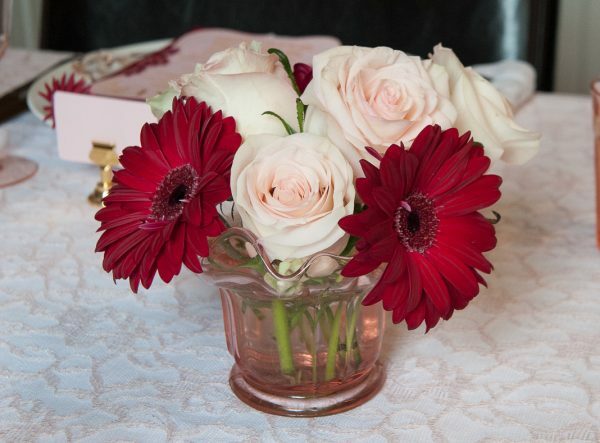 We also incorporated the couples’ updated favorite of maroon Gerber Daises. 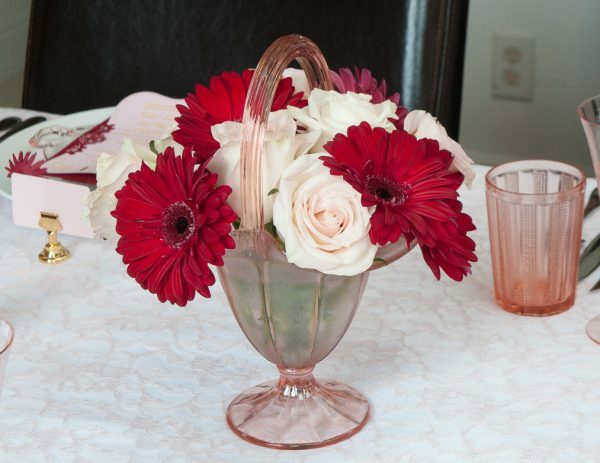 We ordered the Gerber Daises from a floral shop because they’re not commonly found. 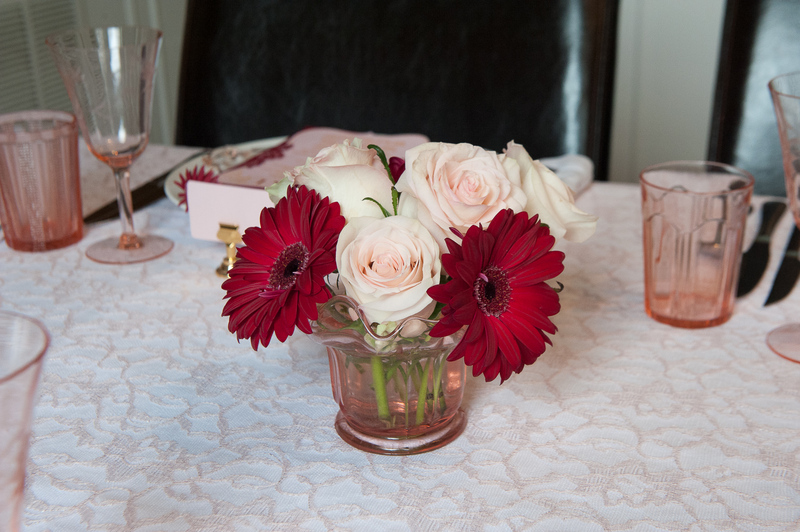 The pale pink roses came from Costco and everyone loved them! Trader Joe’s and Costco are my go to places for inexpensive and beautiful flowers. 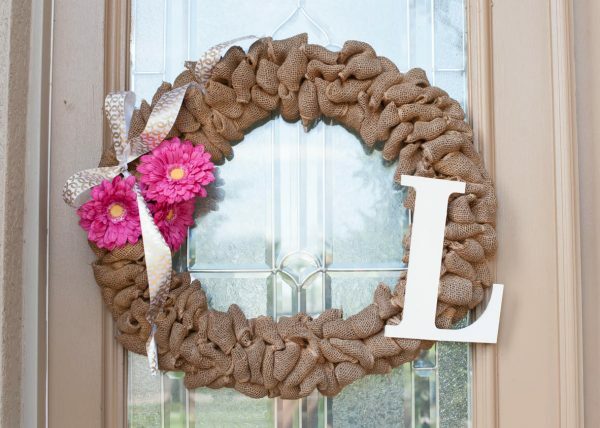 We have two burlap wreaths on our front doors. 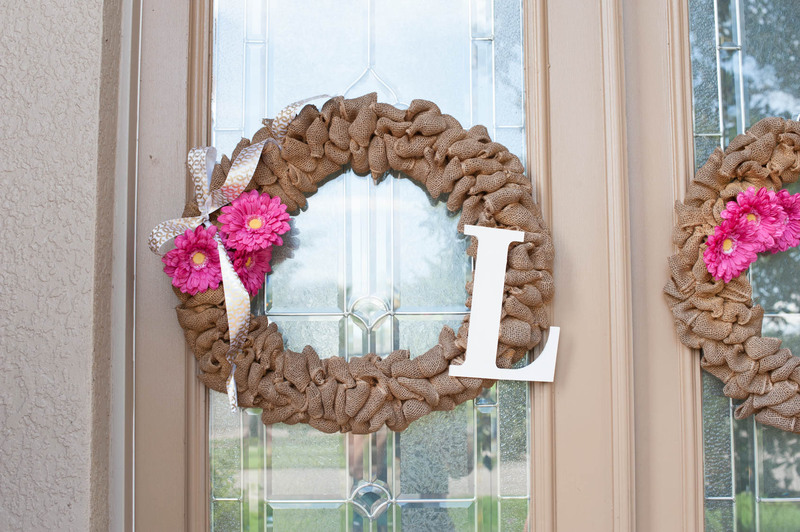 I like to change out the decor on these wreaths to match the themes of the parties or dinners that we do. 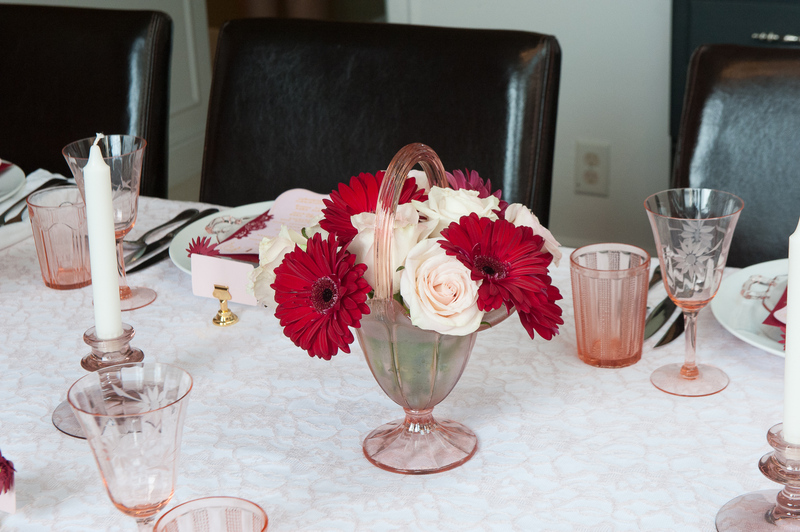 We can easily change out the flowers or bows to match the party. 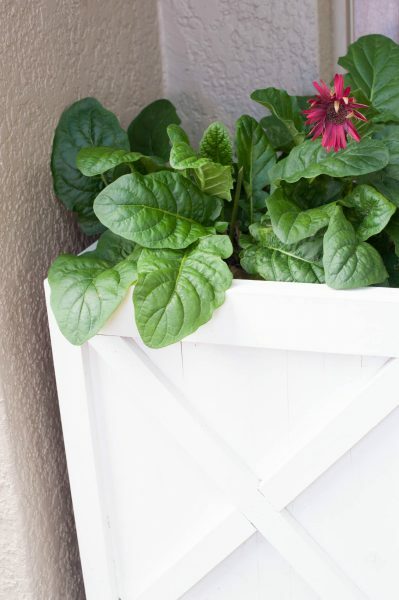 White planters by my front door held light and dark pink Gerber daises for my dinner. 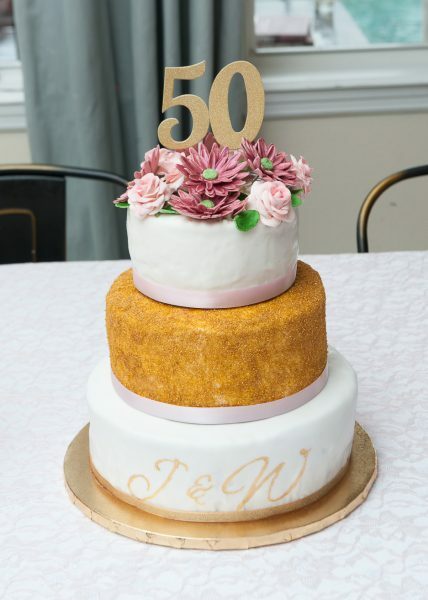 We did a three-layer cake that incorporated the color scheme and the flowers that were featured in the dinner. 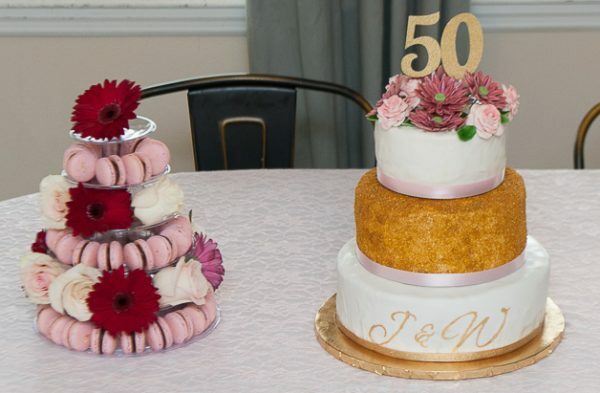 The top two layers were white chocolate cake with raspberry filling, and the bottom layer was chocolate fudge cake with salted caramel. Both recipes were inspired by cake recipes in Baked cookbook and online videos on Craftsy here. The cake recipes in this book not only taste delicious but they also make very flat cake layers that are easy to stack. The middle layer has edible gold glitter on it, and the bottom has painted luster dust (mixed with vodka) for the painted letters. I made a stencil on my Cricut Explore Air 2 for the letters to get the font just right. We made the sugar flowers out of gum paste ahead of time and then let them harden for later use. Whenever I need a refresher on how to make a particular flower, I visit YouTube or Craftsy because they offer great instructional videos. Before the party we made raspberry macarons with chocolate ganache. Macarons freeze beautifully so you can make them ahead of time. 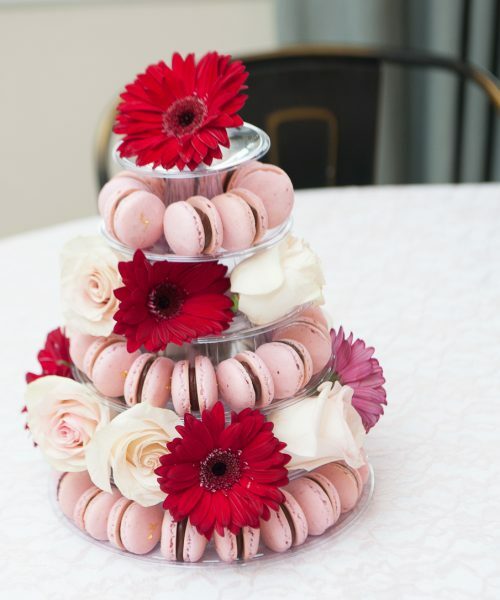 Macarons take a little practice to master the basic technique, but once that’s mastered, you can make an array of flavors and colors for your parties. 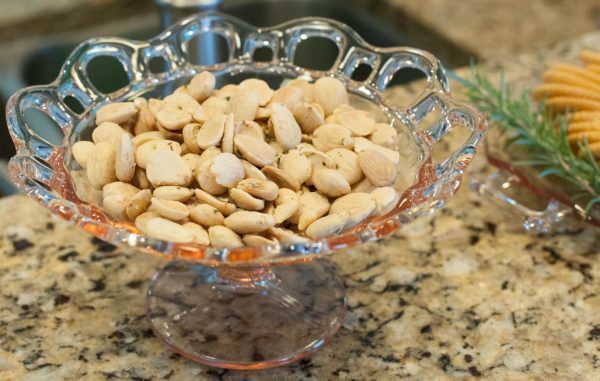 My favorite no fail recipe (and tutorial) comes from Colette Christian on Craftsy here. 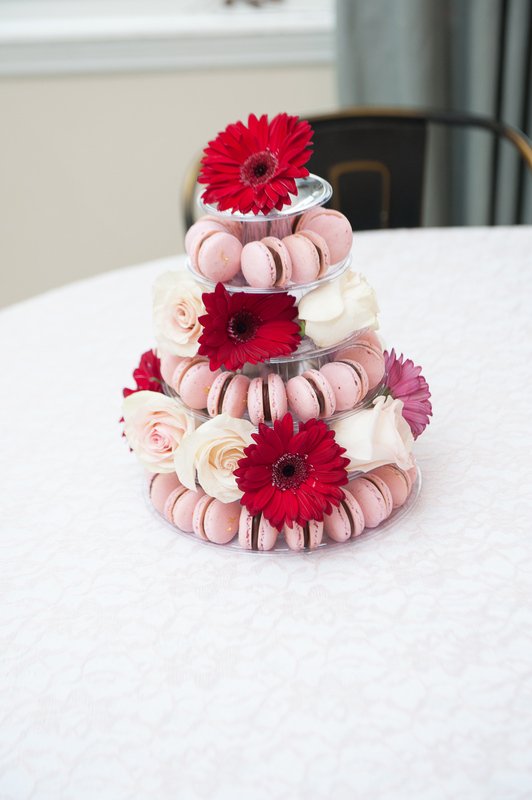 This beautiful macaron tower from Amazon makes the macarons look like a tiered wedding cake! 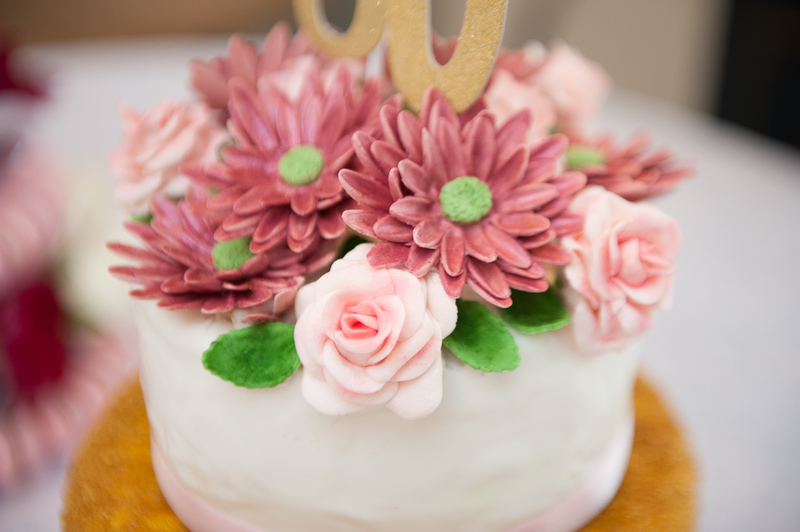 We decided to also incorporate the flowers in some of the layers of this faux cake. When you make macarons, you add gel food dye to make the pink color above. The fun thing about macarons is that you can make them any color to match your flavor or theme. For these macarons, we also added a bit of edible gold on the top for the 5oth golden anniversary! It’s always nice to have munchies when the guests arrive to the party. 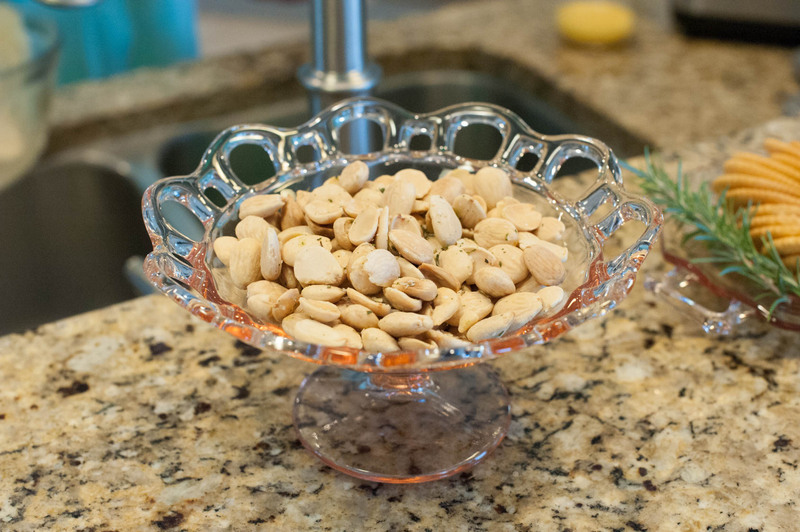 We made these Thyme Roasted Marcona Almonds ahead of time. 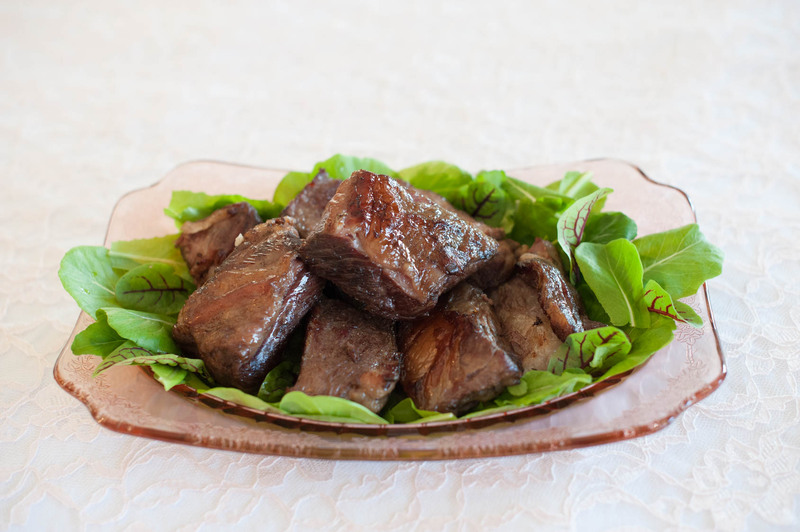 This is another great recipe by Ina Garten. 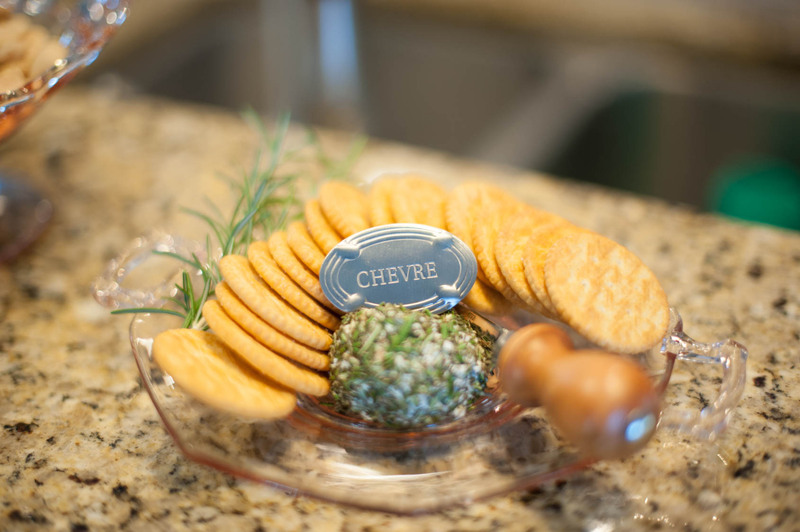 We grow rosemary in our garden and we always have it on hand for this easy appetizer. 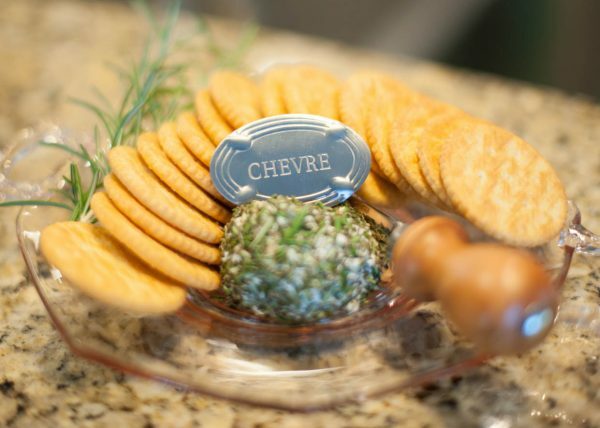 Simply roll a ball of goat cheese and cover it in minced fresh rosemary. 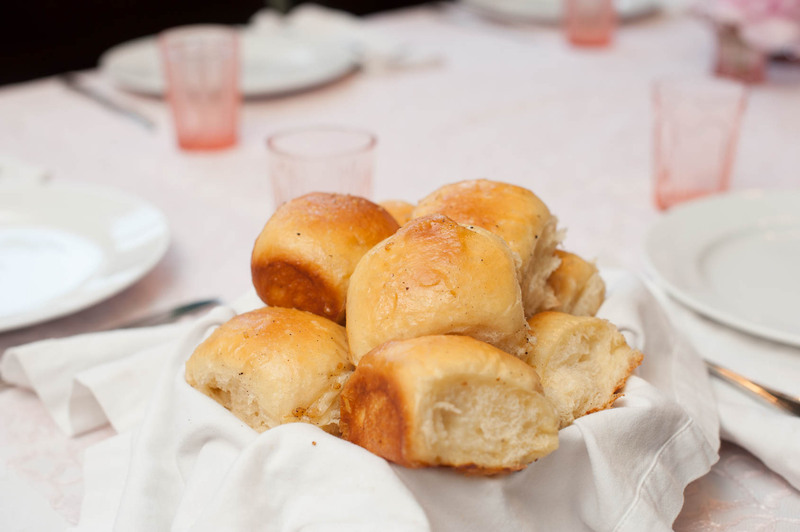 We love this recipe for Buttery Pull Apart Dinner Rolls from Bon Appetit! 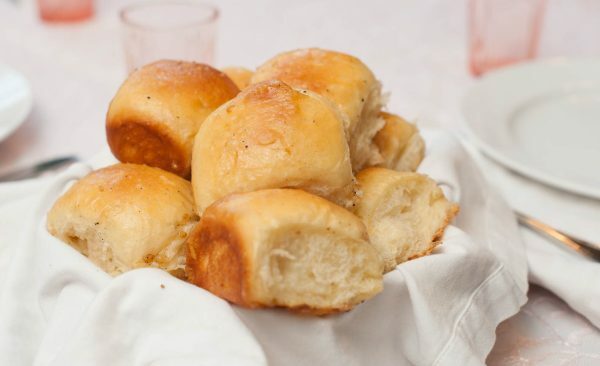 This recipe uses brown butter and garlic– two of our favorite ingredients! 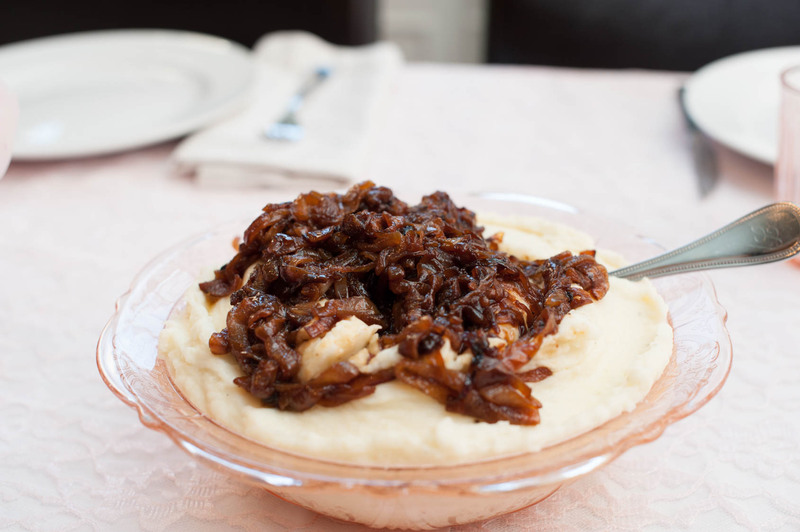 Want to take your mashed potatoes to the next level? Adding the mascarpone made the mashed potatoes so creamy and yummy. 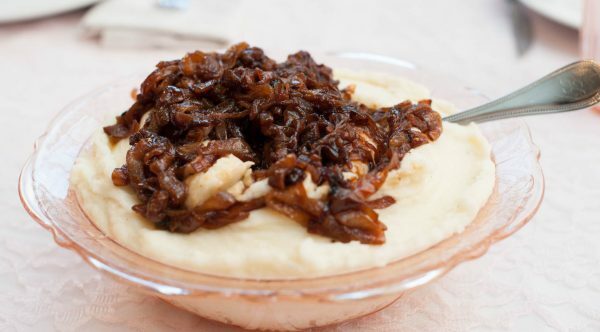 We also like to add caramelized onions to the top of the mashed potatoes. 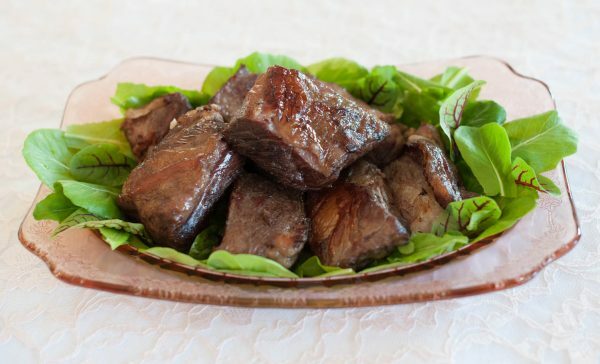 The star of the show were the 48 hour Asian short ribs made in my sous vide machine. 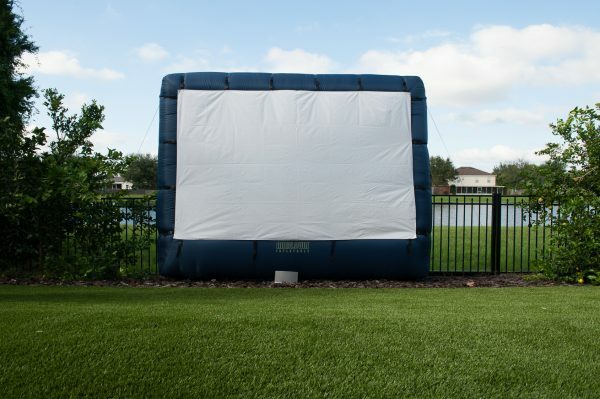 After dinner we headed outside to watch a short movie with pictures of the couples’ milestones over their 50 year marriage. We played music to complement the movie. 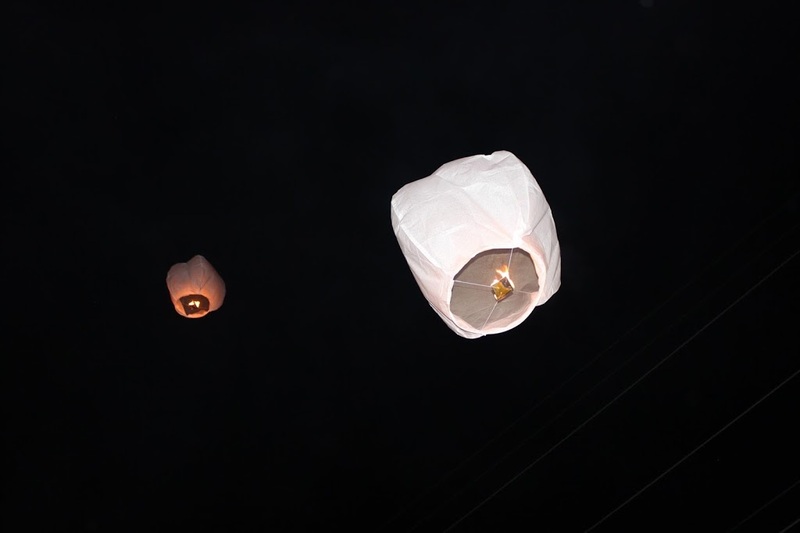 Each guest wrote a wish on a wishing lantern, and we released them! Thanks so much Rosella! Make sure you subscribe on the bottom of the homepage so that you are notified when I write a new post.